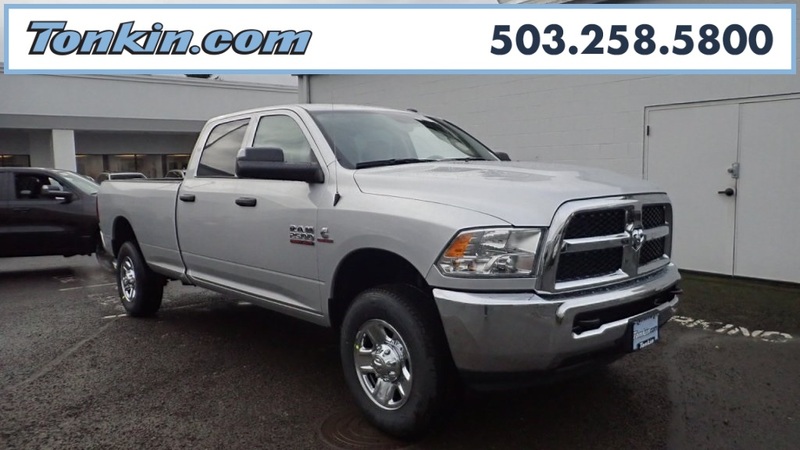 2018 Ram 2500 Tradesman Bright Silver Clearcoat Metallic Backup Camera, Bluetooth, Hands-Free, 1-Yr SiriusXM Radio Service, 3.42 Axle Ratio, 5.0" Touchscreen Display, Bright Front Bumper, Bright Grille, Bright Rear Bumper, Charge Only Remote USB Port, Chrome Appearance Group, Diesel Exhaust Brake, For More Info, Call 800-643-2112, GPS Antenna Input, Integrated Voice Command w/Bluetooth, Media Hub (USB, AUX), Overhead Console, Premium Wheels, Quick Order Package 2FA Tradesman, Radio: Uconnect 3 w/5" Display, Rear View Day/Night Mirror, SiriusXM Satellite Radio, Temperature & Compass Gauge. ***Call (503) 258-5800 to speak to a Sales Manager*** Come in to Ron Tonkin Chrysler Jeep Dodge Ram Fiat in Milwaukie to test drive today! DL0087.